What you will see is commonly known as “gai choy” in Cantonese OR “jie cai” in Mandarin. It is known as a mustard green, Brassica juncea, which is a species of the mustard plant. History: Several varieties of this plant appears in Chinese, Korean, Japanese, African, and Italian cooking. Africans primarily use the leaves while Asians use both the leaves, seeds, and stems. 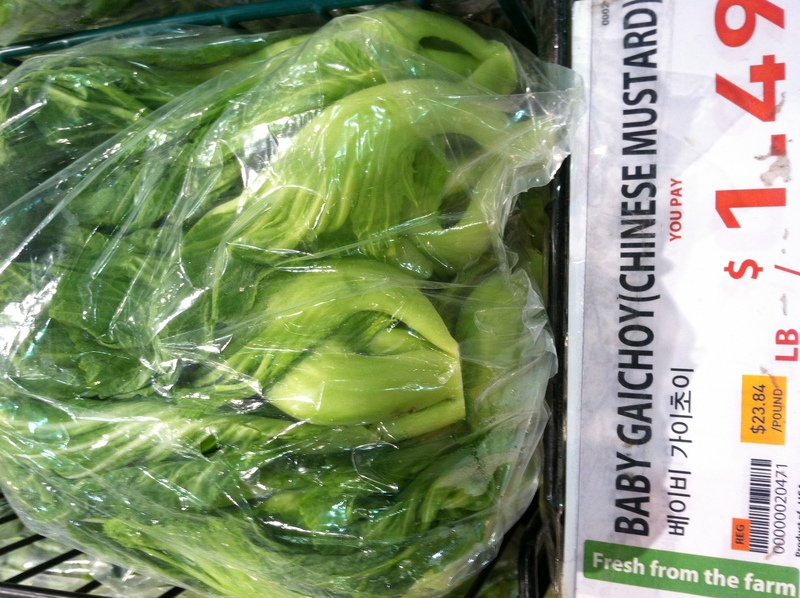 Gai Choy is usually sold packaged. There won’t be a time where you could actually choose bunch by bunch. Also, disregard the $23.84 per pound amount. Never heard of vegetables being 90% on sale, nor have I ever seen gai choys that expensive. This here, is the baby variety. The regular variety is even larger, which is why many people like to chop up the leaves into smaller pieces and pickle it. The key to picking the correct batch is to look at each bunch inside. Obviously, you want to choose the bag with the freshest gai choys inside. Make sure the leaves are not withered and that there are not too many bruises on the stem. The yellowing of the leaves also means that it was left out in the sun for too long after picking or a lack of hydration. To wash this vegetable, you want to submerse them fully in a tub of water. After 3 minutes, you can start gently rubbing the stems because they are quite hard and can withstand this type of cleaning. Each bunch of gai choy doesn’t have that many stems. 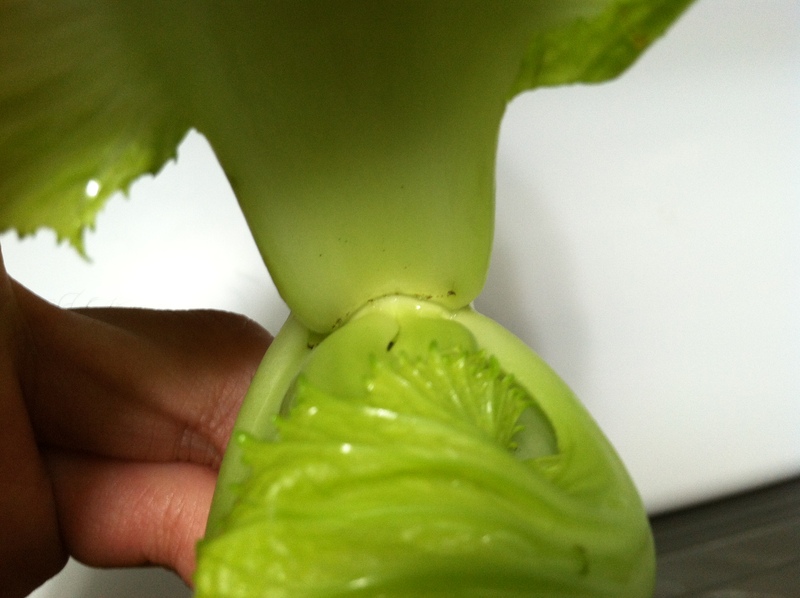 Also, this variety of vegetable tends to have dirt and baby aphids lodged deep inside the crevices, as seen in this photo above. Make sure you dig in with your fingers/nails and get those sly suckers out. Once you’ve dried the jie cai, mince some garlic. Put a table spoon of oil into a frying pan and turn the heat on high. Once the oil starts bubbling, carefully put the garlic in. As the garlic starts to yellow, you may now put the gai choy in. NO SALT. When cooking gai choy, you have to be pretty involved because of the wide spectrum of thickness in just one leaf. Make sure the stem spends more time touching the frying pan by shifting the vegetables around with chopsticks or your battle tool of choice. Fear not if it tires you because you should only be pan frying this mustard green for 2 minutes. Taste: You’ll appreciate the fact that there’s no salt because it allows your taste buds to taste the full character of the gai choy. It’s called mustard green for a reason. No, remove the thought of the mustard you’d put on a ball park frank. The flavor is much more closer to dijon mustard than its cousin, the deli mustard. An even better comparison is wasabi (which is a type of mustard/horseradish). I say this because the mustard is less accentuated and a few seconds after chewing, you’ll notice the same type of mild spicy kick that wasabi gives off. Yes, there is a tad bit of bitterness as well, but about 1/1,000 the the intensity of the red dandelion. Texture: The leaves of the gai choy do not have miniscule hairs popping up like the shepherd’s purse for example. Instead, it’s paper thin, and is comparable to the napa cabbage leaf. Lastly, the stems are hard and crunchy, but different from the broccoli stalk. How does it differ if they’re both hard, crunchy, and tough? Well it’s a different type of crunchy. When you bite into a broccoli stalk, it is easy to get a clean break in between the stalk. As for the jie cai, the crunchiness is there; however, there is no clean break but a few more bites can get the job done. 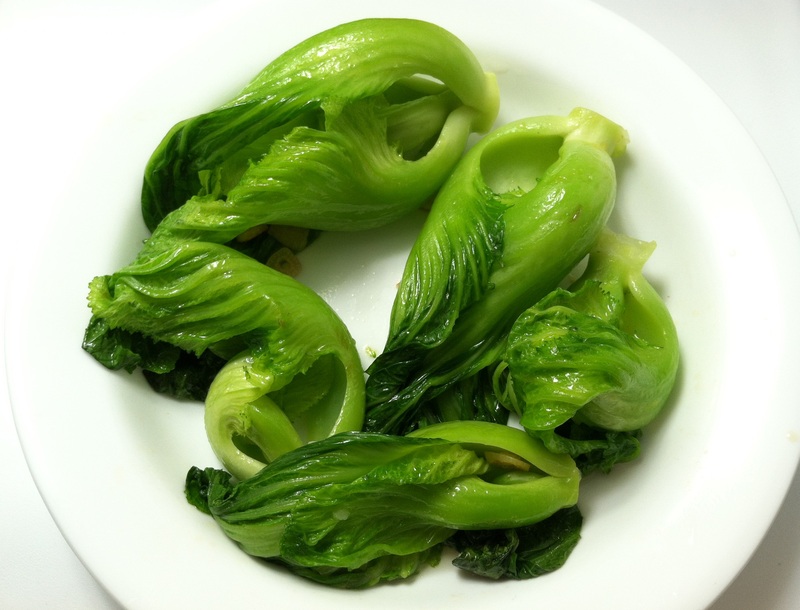 What is your favorite dish for gai choy / jie cai ? Put your recommendations in the comments below! Or you can tweet http://www.twitter.com/homeyeats . I made stirfried gai choy for the first time tonight. I was surprised by the intensed bitterness. Usually we have it chai boey style so the bitterness is pretty mellow. Having it fresh and stirfried retains its character and crunch. Not unlike bittergourd. Not too bad I should say. Nice! Did you sense the mustard-like bitterness? What is chai boey? I like the way you describe the chai boey. Bittergourd is your culture’s way of calling bitter melon? Love the input!